To those of us who live and work in the Illawarra region, it’s home. A place built on a rich history of steel and mining. A place where we all know the peaks and troughs of Australian industry and the resilience it takes to run a business. A place built buy hard working men and women who spend their day to day labouring somewhere between the mountains and the sea. Of course, as an eclectic group of realists, it’s easy to be consumed by the negatives. The down sizing of BlueScope, the knock-on effect this has had on dependent companies, infrastructure that needs upgrading and THAT Rabbitohs field goal back in September. Sure, we have our challenges but let’s take a look at a report recently released by global advisory firm Deloitte. Their report analyses our city and makes many interesting observations about our location, resources, investment, proximity, infrastructure and access to skilled talent through the initiative of the University Of Wollongong. The cost of Labour is approximately 85% of the cost of labour in Sydney. Retention of employees is high with a comparatively low employee churn rate of 5% compared to Sydney’s 25%. This all sounds impressive but what does it mean? As we can see, this is a well-run business, achieving sound margins and a healthy profit. Next, we began adjusting the numbers to take into account the ‘Illawarra factor’. First, we reduced labour by 15% then we reduced rent. We could have reduced rent by anything up to 50% but we took a conservative estimate for the comparison and reduced rent by 30%. To be completely fair we then looked at additional expenses that may increase due to this particular business being based in the Illawarra and not in Western Sydney. We raised Freight by 40%, Motor Vehicle Expenses by 50% and Travel costs by 100%. The latter assumed that the personnel within the business would have to travel to further to service a comparative market size. That said, this business has less than 10% of it’s market in Sydney and is servicing customers all over the country so maybe we were getting a little paranoid. 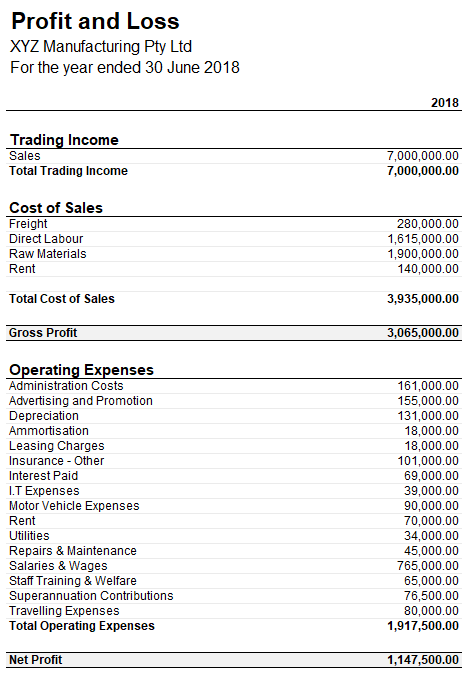 As can be seen by the revised Profit & Loss Statement below, the result is VERY different. 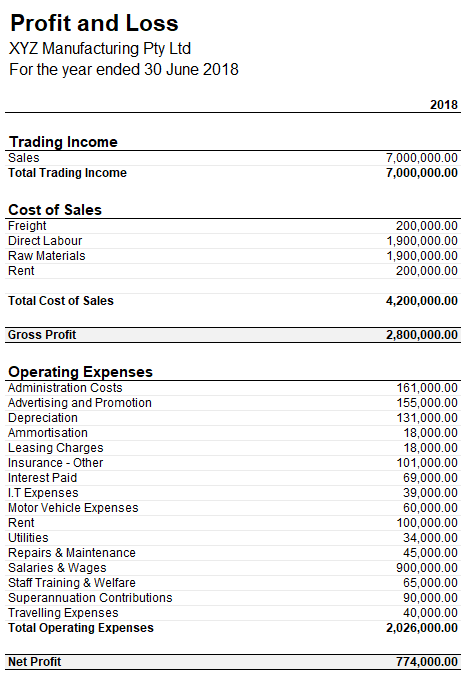 In summary, the Gross Profit margin increases by 4%, the Net Profit Margin increases by 5%, and the tangible Net Profit increases from $778K to $1,147K (47%)! Now let’s be realistic, this Sydney Manufacturer probably can’t and won’t relocate to Wollongong any time soon. However, I would like to challenge every business owner in the Illawarra, are you capitalising on this opportunity? The advantages don’t stop with the profit margins. We have a large pool of skilled talent constantly graduating from the University of Wollongong. Let’s reduce the 20,000 plus people commuting their talent out of town every day. A lot of our talent relocates to Sydney or interstate to larger cities. Even if salaries in Wollongong are 10% – 15% lower than Sydney, the cost of real estate is typically 35-40% lower in the Illawarra. The great Australian dream gets closer. We have a great public transport system and logistics networks to get our people, services and products to the rest of Australia. Residents of the Illawarra enjoy a great coastal lifestyle, world class healthcare and modern shopping, hospitality and entertainment facilities. How are you using the unfair advantage we have being right here in the Illawarra? Maybe it’s time to check our doorstep for growth opportunities? With over 40 years’ experience working with Wollongong businesses, we’re ready to help you step up and build another great local legacy.